I am working on socks again. I think that I am becoming a sock knitter! 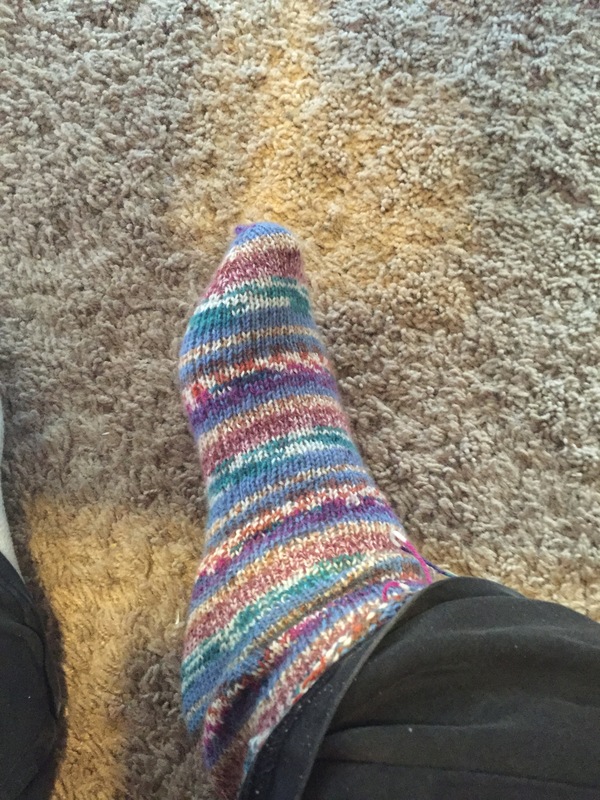 I like knitting socks because they are small projects that I can take with me everywhere I may have to wait for something, and they are also relatively quick projects so I get quick gratification when I finish a pair. They are also very time consuming in that they take so many stitches because of the tiny yarn that you have to use. I finally got the right needle size for the tiny yarn. I use a US size 1.5, 2.75 mm Addi Turbo fixed circular with a 47-inch cable, with Lang Jawoll Color Aktion yarn. I have the reinforcing thread to match this yarn. I didn’t use the reinforcing thread on my first sock. I plan to use it on the second sock to see how they wear. I have been told that the reinforcing thread makes the sock more durable. My gauge is 8-1/4 stitches per inch. I think the next pair I will use a US size 1 needle to get approximately 9 stitches per inch. I have been told that a gauge of 9 SPI will give me a very durable sock that will last and last. I am hoping that this pair of socks will last as well. They do fit my foot quite nicely but they don’t have that 10% negative ease that I have read about. They fit snugly but not really tight on my foot. I do wear compression hose every day to keep swelling out of my legs, ankles, and feet. The compression hose take up a good amount of room on my foot, and when I tried the sock on with the compression hose, it fit snugly. When I tried the sock on without the compression hose last night, it fit snug but not tight. I don’t know if the socks will stay put in my shoes or not. I guess I will find out when I get done. At first, I was going to not worry about matching the 2 socks. I just wanted to knit 2 socks, ya know? But then as I was knitting the start of the second sock, I noticed that it didn’t start at the same place and the self-striping would be way off instead of just a little bit off. It started in the middle of the repeat and I couldn’t stand the way that it was going to look, so I took it all out and wound the thread off the skein until I matched the beginning of the second sock so that it matched the first sock. I still think I wasted that yarn but others have said that it was okay to waste just that little bit. I matched the start of the second sock perfectly and the self-striping will be perfectly aligned with the first sock so that they match 100%. That makes me so happy! I want this pair of socks to be pretty, and I believe with the matching they will be. I am calling them my southwestern socks because of how the self-striping is working out. The colors are as close to southwestern colors as one can get. I am so excited to be almost finished with this pair of socks! I am at the point of starting to build the gusset. 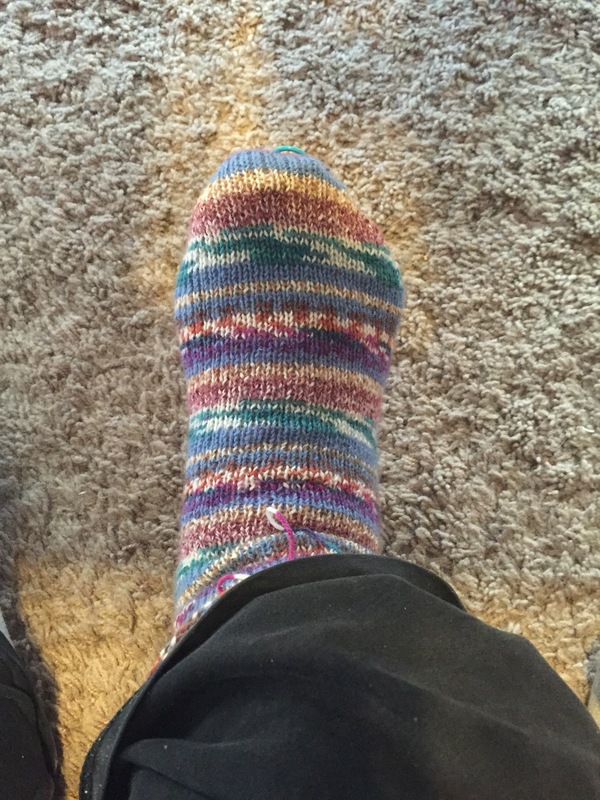 I am doing toe up socks, and the sock is almost to my instep. Maybe another 3 or 4 rows and it will be at the point where I start increasing to make the heel. See? Doesn’t that colorway have a southwestern feel to it? I think it does. It looks really good on my foot, too. J I will post again when I am done with the second sock and model them for the camera! I can’t wait to be able to wear a pair of socks that I made. Then I have to finish the first pair that I started making, the blue ones. I lost the second ball of yarn to finish the pair, but I have found it now so that I can finish that pair as well. Then I will have 2 pair of regular socks plus 2 pair of bed socks which are my ugly socks and my pretty in pink socks. I can’t believe that I have almost finished 2 more pairs of socks! Woo Hoo! It doesn’t take much to excite me you know? J Anyway, as I am going on and on about nothing really, I am going to close this entry. Until next time! Anyway, I am loving how this self-striping yarn is knitting up. When I first cast on my yarn was purple with some blue, and it moved on through brown, rust, turquoise, white, beige, blue, deep turquoise, magenta, and on and on. The color repeated itself quite nicely, and I managed to get my favorite part of this colorway, which was the turquoise and white section, on the heel of this sock. I tried them on this morning, and they fit so nicely! I followed Liat Gat’s toe-up sock pattern on her website, KnitFreedom.com. I used size 1.5 needles to get gauge. This time, they fit me! 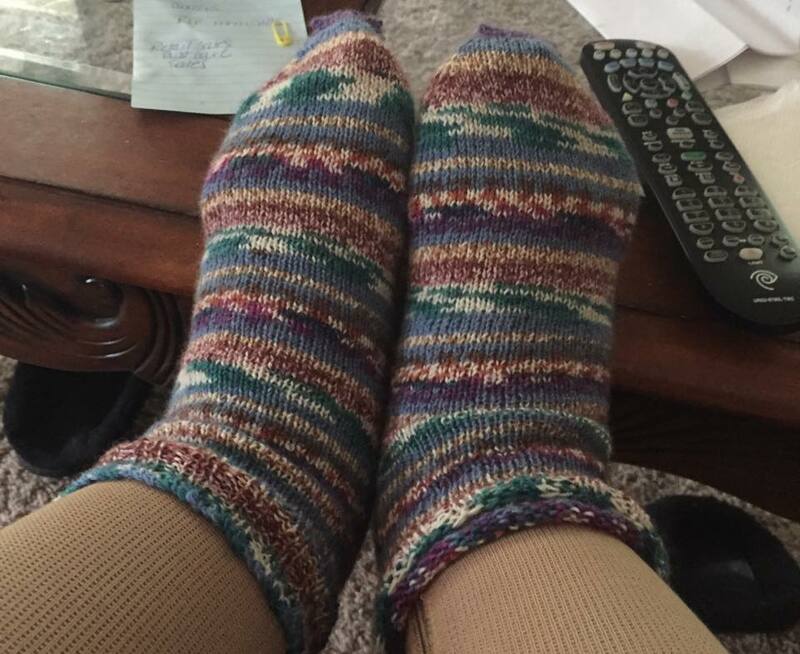 I made another pair of socks that were way too big because the needle size that it took to get her gauge was a size 3 needle. Her gauge was 7 stitches per inch. I talked with some knitterly friends of mine and they said that I should go for 8 to 9 SPI in order to get a good fitting sock. The US 1.5 works wonderfully. I am doing Magic Loop and using a 47-inch cable to do it. I love the toe-up sock construction. 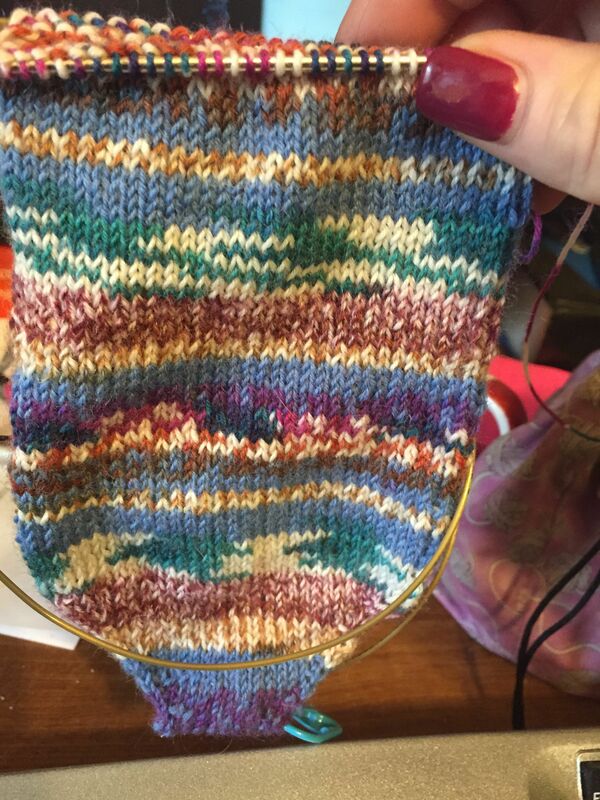 I find the top down sock hard to execute, especially the gussets and the short row heels. I like the no short rows option of toe-up socks. This pattern uses Fleegle’s heel, and that one is really easy to execute. I am not a fan of short row anything, although I will probably need to learn how to do it in the future. Does anyone have a favorite way to do short rows that you can share with me please? Right now, I love my new socks. Here is a picture of the one that I have almost finished. I might go down another size to a size 1 with the matching sock to see if I can get just a little bit tighter fit. I don’t know if that will make the self-striping not match. I guess I will see, huh?